The blue-white-blue pattern is common to all the central American states, being a reminder of the union from the beginning of the 19th century. Each of the five original countries found a way to differentiate the flag. Costa Rica put a red stripe in the middle, Nicaragua and El Salvador their coats of arms, Honduras five stars, and Guatemala turned the stripes vertically. All of the states (except Guatemala) have common elements on their coat of arms - mountains (volcanoes) with a sea on each side, secessionist cap, spectrum, stars, and the inscription 'America Central'. The triangle symbolizes equality. Civilians on the land may use, also, the flag without the arms. The National Flag: The white stripe stands for the territory of our nation and represents the purity of our fatherland. The two blue stripes mean our territory is bathed by two oceans. According to [smi75], Honduras entry (page 241) "The blue-white-blue horizontal striped flag of the United Provinces of the Center of America, based on the Argentine flag, was first hoisted in the independence struggle against Spain on 4 July 1818, when the commodore of the Argentine squadron, Louis Aury, proclaimed the first independent Central American state on islands off the eastern coast of Nicaragua. 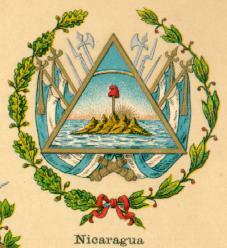 Aury's government lasted until 1821... ...(in 1823) when complete independence was established the new national flag had stripes similar to, and apparently based on, those of the first free state.."
At "Nouveau Petit Larousse Illustre" (1924) - Nicaragua: An emblem without circle of text, without rays, with a sea in the foreground and a thin black line around the triangle to distinguish it from the white background. I remember that Nicaragua used silver letters in place of gold for lesser government offices. Is this practice dropped? I would rather say that escudo was reportedly written in black (cf note of Album 1990). Yet all photos received from Nicaragua (and also infos from vexillological sources) all showed escudo in full colour (and letters in gold); this is why I dropped the note of Album 1990. According to [pay00] - National Flag (CSW/CSW 3:5) - Blue-white-blue horizontal tricolour with the coat of arms in the middle. The coat of arms is that inherited from the Central-american union, five vulcanoes, two oceans, freedom hat, sun-rays, rainbow, all within a triangle and surrounded with the name of the state. The ratio 3:5 is found in [smi75] [smi82] [vdv00] so also in [pay00] and probably in some other sources. However [neu92] has the images (this and next one) pictured as 1:2. Flaggenbuch also explains how the lower governmnet offices display the flag with silver inscriptions. IIRC, the FOTW suggests that such notion is more a "vexillological mith" then anything else. "The national and merchant flag and ensign of Nicaragua also places the national arms at the centre of a flag striped horizontally, blue, white, blue, but the flag itself is considerably longer than those of either Honduras or El Salvador." This is a bit curious as Honduras is 1:2 as well, but the important part would be to distinguish it from El Salvador which it closely resembles, especially as he pictures El Salvador and Nicaragua with a lighter shade of blue. And indeed, where he pictures El Slavadoe approximately 3:5, Nicaragua is pictured approximately 1:2 (and so is Honduras). This would suggest the ratio of the flag changed when with that 1971 adoption. Article 13. - The symbols of the nation are the National Anthem, the Flag and the Official Seal as established by law that determines their characteristics and use. Translation: P. Vagnat & J.Poels book on Constitutions and flags [vap00]. This flag was originally that of the United Provinces of Central America (independent 1821) from which Nicaragua succeeded in 1838. It was re-established by a Decree of 4 September 1908, and regulated by Chapter II, Article 2 of Decree No. 1908 dated 23 August 1971 (which laid down the ratio as 3:5 and defined the colour as 'cobalt blue'). A plain triband without arms is in widespread use, it is officially tolerated but has not been formally sanctioned by law. The arms, originally adopted on 21 August 1823, are those of the former United Provinces of Central America. The stripes are officially defined as "cobalt blue", which is translated by the UK Flag Institute, BRR20 and the Album des Pavillons as PMS 300C. No recommendaaations appear to be given by any source for the arms. According to [pay00] - a plain flag (BWB, no CoA) is used as Alternative civil ensign. According to [pay00] - Alternative Civil Flag (C--/--- 3:5) - The same triband without the emblem. Again Flaggenbuch disagrees. Apart from the thing with the ratio, there this is captioned merchant flag, (i.e. at least ---/C--). Obviously something has changed about the Nicaraguan flags since WWII. Rectangular Triband is used also as Aircarft Marking. The present form of the flag was established by a Decree of 4 September 1908, and this stipulates that the national emblem shall appear in the centre of the flag but makes no mention of a civil or merchant flag without arms. Such flags are, I am told, widely used in Nicaragua, they are apparently officially tolerated but unofficial. Whitney Smith presents flag with coat of arms as national flag and civil flag, and plain BWB flag as alternate civil flag. The national coat of arms: The five volcanoes in the republic's coat of arms stand for the five Central American countries, the rainbow for peace and the Phrygian cap for freedom. This image of the coat of arms from a Dutch scouting encyclopedia (<www.scouting.nl>) is slightly different. However, when compared with Smith (1975b), Smith (1980) and Crampton (1989) (which are the same apart from black outlines of the gold letters in Crampton and minor shade differencies) the following discrepancies can be identified: 1) the upgoing ray is "under" the rainbow 2) relative position of the five rays touching the sea is tighter (so they all come "within" the volcanos 3) rays are thinner (but that might not be of importance due to smaller images) 4) the cap is somewhat smaller (but as above again) 5) volcanos seem to be (only slightly) higher and steeper 6) two dots in inscription are smaller 7) the spaces between words in the inscriptions are much smaller (a much bolder font would solve this). The coat of arms of Nicaragua was basically adopted on 21 August 1823 (as coat of arms of Central America), but it underwent several changes, until the last version (1999) was introduced in 1971. The coat of arms mentioned by Mr Heimer are from a "third class source" and is completely incorrect. Before Nicaragua became one state (in 1825) there were two governments: Leon and Granada. In the french flag book [pay00] there is a different coat of arms figured for Nicaragua than on the above as also in older books like Smith (1980). Anybody knows when the new coat of arms was adopted? W. Smith in his FSS 1993/66 features the new coat of arms. Yet in a 1998 note, French naval Commander in Antilles adds to a photo with that new coat of arms a leaflet of Nicaragua Tourism department featuring a national flag with a simplified black and white coat of arms.